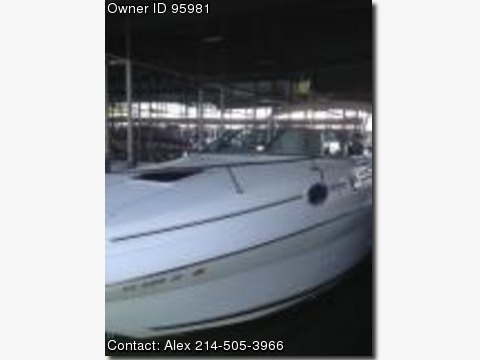 Call Boat Owner Alex 214-505-3966. Description: 2000 Sea Ray 240 Sundancer,This 2000 SeaRay 240 Sundancer is ready to go. Owned by original boat owner. Powered by a Merc 210 horsepower I/O. The cockpit features beverage holders, convenient side storage. All leather is clean and free of any tears. 3 covers: bimini, cockpit for storage, all full camper enclosure. There's also a portside sun lounger with forward-facing backrest to provide even more room for family and friends to sprawl out and relax while on board. The lockable cabin door has integral fiberglass steps built right into it for easy access to the foredeck by the walk-through glass windshield with stainless steel supports. A walk-through transom leads to the swim platform that allows maximum cockpit space. This Sea Ray 240 Sundancer also offers a wealth of standard technical features for easy, reliable operation - like power steering, power tilt and trim, and Sea Ray's gauges with anti-glare coating. Additional standard equipment includes a pressure water system, automatic bilge pump, engine alarms, Lowrance 3500 depth finder, and hydraulic trim tabs. Below, the cabin layout encompasses plentiful storage space, a convertible dinette with storage below, dining table with dedicated storage, and an enclosed fiberglass head. It will sleep 4 comforably two in the rear berth and 2 in the make to bed area. Built in AC air conditioner. The galley has a dual power fridge and stove. Has AM/FM/CD w/equalizer, carpet, Coast Guard pack, dockside power, dual batteries, and matching dual axle trailer.